Smith, A. L. 1937 Structure A-XVIII, Uaxactun. Publication 483, Contribution 20. Carnegie Institution of Washington, Washington, D. C.
Smith, A. L. 1943 Explorations in the Motagua Valley, Guatemala (with Kidder, A. V.). Publication 546. Carnegie Institution of Washington, Washington, D. C.
Smith, A. L. 1950 Uaxactun, Guatemala : Excavations of 1931-1937. Publication 588. Carnegie Institution of Washington, Washington, D. C.
Smith, A. L. 1955 Archaeological Reconnaissance in Central Guatemala. Publication 608. Carnegie Institution of Washington, Washington, D. C.
Smith, A. L. 1961 Types of Ball Courts in the Highlands of Guatemala. In Essays in Precolumbian Art and Archaeology, compiled by Stone, D. Z., Bird, J. B., Ekholm, G. F., and Willey, G. R., pp. 100-125. Harvard University Press, Cambridge. Smith, A. L. 1962 Residential and Associated Structures at Mayapan. In Mayapan, Yucatan, Mexico, by Pollock, H. E. D., Roys, R. L., Proskouriakoff, T., and Smith, A. L., pp. 165-320. Publication 619. Carnegie Institution of Washington, Washington, D. C.
Smith, A. L. 1968 Reconstruction at the Maya Ruins of Seibal. In Monumentum 2 : 82-96. Internationl Council of Monuments and Sites, Paris. Smith, A. L. 1969a Seibal, Guatemala in 1968 : A Brief Summary of Archaeological Results (with G. R. Willey). In 38th International Congress of Americanists, vol. 1, pp. 151-159. Kommissionsverlag Klaus Renner, Stuttgart-Munich. Smith, A. L. 1969b The Ruins of Altar de Sacrificios, Department of Peten, Guatemala : An Introduction (with Willey, G. R.). Papers of the Peabody Museum Vol. 62(1). Harvard University, Cambridge. Smith, A. L. 1972 Excavations at Altar de Sacrificios : Architecture, Settlement, Burials, and Caches. Papers of the Peabody Museum Vol. 62(2). Harvard University, Cambridge. 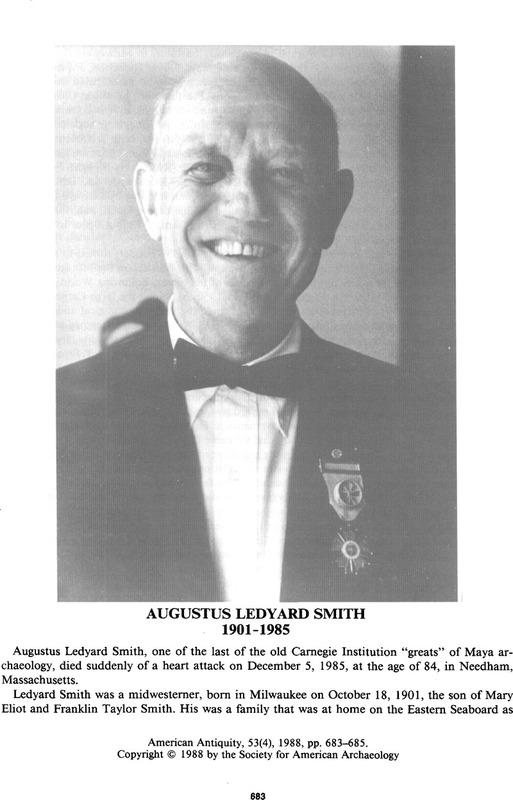 Smith, A. L. 1973 Uaxactun : A Pioneering Excavation in Guatemala. Addision-Wesley Module in Anthropology No. 40. Addison-Wesley, Reading, Massachusetts. Smith, A. L. 1975 Excavations at Seibal, Department of Peten, Guatemala : Introduction : The Site and Its Setting (with Willey, G. R., Tourtellot, G. III, and Graham, I.). Monograph 1, Memoir 13. Peabody Museum, Harvard University, Cambridge. Smith, A. L. 1977 Patolli, at the Ruins of Seibal, Peten, Guatemala. In Social Process in Maya Prehistory, edited by Hammond, N., pp. 349-363. Academic Press, London. Smith, A. L. 1982 Excavations at Seibal, Department of Peten, Guatemala : Major Architecture and Caches. Monograph 2, Memoir 15. Peabody Museum, Harvard University, Cambridge.